Holly and Polish: A Nail Polish and Beauty Blog: My favorite top coat! I'd love to try this out. All the other polishes I have tried either bubble or take forever to dry!! Interesting..I too have tried a ton. So many folks LOVE Dimonate from Nubar - I bought 3 bottles of it and it was soooo sheer/thin and not enough shine. I am a big fan of SV myself. I do have their 'restore' if needed. However, I tend to use a lot of topper between putting on an extra coat every other day - so I don't have much issue that folks complain on with SV getting too thick to use at the half way point of the bottle. Need to add the "cons" of miracote... 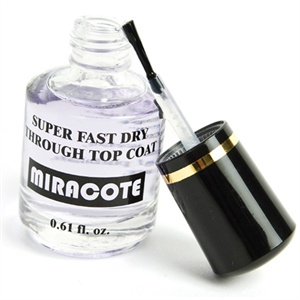 I bought this on your recommendation and while it does dry pretty fast and is the shiniest top coat ever, it's a bad choice if you do nail art- it smears more than one color :( it also doesn't dry as fast as some of the top coats ive used and if you aren't patient, it'll smear everything underneath the miracote. When I use just one color, miracote is great. Otherwise I stick to sally Hansen diamond flash in the black bottle. Works like a charm!